Caught in a violent storm and blown far off their intended course, five American airmen--flying the dangerous Himalayan supply route known as "The Hump"--were forced to bail out just seconds before their plane ran out of fuel. To their astonishment, they found they had landed in the heart of Tibet. There they had to confront what, to them, seemed a bizarre--even alien--people. 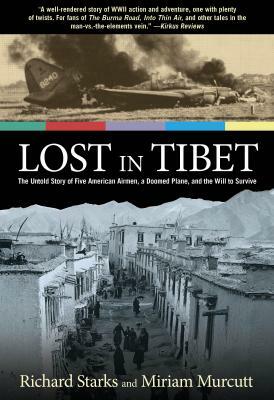 At the same time, they had to extricate themselves from the political turmoil that even then was raging around Tibet's right to be independent from China.Now back in print, Lost in Tibet is an extraordinary story of high adventure that sheds light on the remarkable Tibetan people, just at the moment when they were coming to terms with a hostile outside world. Richard Starks and Miriam Murcutt are worldwide travelers, writers, and editors who have authored several books, including A Room with a Pew and Along the River that Flows Uphill. Visit them at www.starksmurcutt.com.